Sturdy yarn dispenser box provides an easy tangle-free solution for multiple crafters to work at one time. 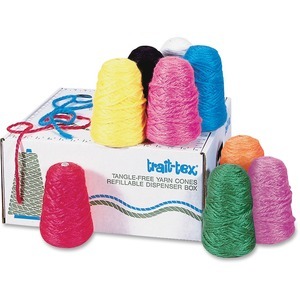 Jumbo acrylic school-roving yarn comes in nine bright colors. Each three-ply, 8 oz. cone includes approximately 150 yards. Colors include white, yellow, red, hot pink, lavender, black, light green, orange and light blue.